206 Hitt St., 1927. Belvedere Apartments. 211 Hitt St., 1927. Beverly Apartments. 920 Cherry St., c. 1837, Niedermeyer Apartments with 30 apartments. 1001 University Ave., 1928, Frederick Apartments. 10 N. Fourth St., 1889, Late Victorian, John William “Blind” Boone house, named to the National Register of Historic Places in 2003. For all the recent media coverage, go to this page. 14 S. Jefferson Road, Mexico, Missouri 65265 — This home is in Audrain County, but included here because it is the home of former Senator Kit Bond. 103 Hubbell Drive, ca. 1910. Anna Hubbell House. Named to Notable Properties 2015, see the newspaper coverage, video and supporting documents. 104 Hubbell Drive, ca. 1924. Craftsman. J.B. and Cora Reno House. Named to Notable Properties 2015, see the newspaper coverage, video and supporting documents. 105 Hubbell Drive, ca. 1927. Craftsman. Bettie H. (Nee Hubbell) House. Named to Notable Properties 2015, see the newspaper coverage, video and supporting documents. 107 Hubbell Drive, ca. 1927. Craftsman. L.D. Walden House. Named to Notable Properties 2015, see the newspaper coverage, video and supporting documents. 108 Hubbell Drive, ca. 1944. English Revival. Dell Rummans House. Named to Notable Properties 2015, see the newspaper coverage, video and supporting documents. 109 Hubbell Drive, ca. 1927. Craftsman. H. Frank Stookey House. Named to Notable Properties 2015, see the newspaper coverage, video and supporting documents. 110 Hubbell Drive, ca. 1927. Craftsman. Frank Ballenger House. Named to Notable Properties 2015, see the newspaper coverage, video and supporting documents. 111 Hubbell Drive, ca. 1927. Craftsman. O.G. Jacobs House. Named to Notable Properties 2015, see the newspaper coverage, video and supporting documents. 112 Hubbell Drive, ca. 1942. English Revival. John L. Ballenger House. Named to Notable Properties 2015, see the newspaper coverage, video and supporting documents. 113 Hubbell Drive, ca. 1927. Craftsman. Esther and John Denham House. Named to Notable Properties 2015, see the newspaper coverage, video and supporting documents. 114 Hubbell Drive, ca. 1927. Craftsman. Ardelia and Ann Jones House. Named to Notable Properties 2015, see the newspaper coverage, video and supporting documents. 115 Hubbell Drive, ca. 1927. Craftsman. L.S. and Shelia Harless House. Named to Notable Properties 2015, see the newspaper coverage, video and supporting documents. 121 N. West Boulevard, 1934-1941, Tudor Revival. The former log cabin of Arch and Blanche McHarg. Original log cabin elements are part of current structure. Named to the Notable Properties List in 2004. Read about the “Hansel and Gretel House,” in this Missouri Life article. As of June 6, 2015, this house is for sale again. 206 Bingham Road, 1928, Tudor Revival. Home of Florence Harrison Bill and Harry Satterlee Bill, who was one of Columbia’s best-known architects, according to this 2017 document created for Columbia’s Historic Preservation Commission. For more information, see these this 2012 article documenting the house being named to the Notable Properties List: Six properties to be honored by Columbia’s Historic Preservation Commission. 211 Bingham, ca. 1927. Georgian Revival. Margaret von Holtzendorff. Named to Notable Properties in 2010. 211 Westwood Ave., ca. 1911, Craftsman. George Reeder. Named to the Notable Properties list in 2008 according to this Jan. 26, 2008 article published in the Columbia Business Times. 213 S. Glenwood Ave., 1916, Colonial Revival. Note: According to supporting documentation, addresses changed over the years; this used to be 107 S. Glenwood in the 1910s.) George P. Brauer. Named to Notable Properties 2015, see the newspaper coverage, video and supporting documents. 214 St. Joseph St., ca. 1903, Late Victorian. George Harrell Jr. Home. At one time, Harrell ran a dry cleaning business at the rear of the property. Named to the Notable Properties list in 2008 according to this Jan. 26, 2008 article published in the Columbia Business Times, written by Mike Martin. 216 S. Fifth St. — This is not on any list, but here is some coverage of it: March 30, 2017 — A rich past, a hazy future, Columbia Missourian. Summary: Article about the house at 216 S. Fifth St., in the shadow of student housing being built. Includes some history of the house and former resident Brian Matney, and owners of the property Adam Dushoff, Jeremy Brown and Matt Jenn. 313 E. Brandon Road, ca. 1940. Colonial Revival. Newell S. and Fern R. Gingrich. 401 West Blvd., South. Note the strange address. West Boulevard was once the western edge of Columbia, Missouri, which is why the street was named West Boulevard. This home was named to the 2017 Most Notable Properties List. It is the original house on a 187-acre farm. 509 Thilly Ave., ca 1909, Craftsman Foursquare. Emma and Lincoln Hyde. Lincoln Hyde was a professor of bridge engineering at the University of Missouri. The four square brick structure includes lower level exterior walls three bricks thick while the second floor is two bricks thick. The limestone used for the foundation was mined from the same site as that used to create MU’s White Campus. Read more about the house in this article, Honoring historic homes published in Mizzou, magazine of the Mizzou Alumni Association. It was named to the Notable Properties list in 2008 according to this Jan. 26, 2008 article published in the Columbia Business Times. 511 Westwood Ave., ca. 1916, Craftsman. Grace and Dr. Edwin B. Branson. Dr. Edwin Branson was the chairman of the Geology Department at the University of Missouri in the early 1900s. The house is built of gunnite, a type of mortar conveyed through a hose at high velocity. The interior and exterior decorative features include wrought iron from New Orleans. Read more about the house in this article, Honoring historic homes published in Mizzou, magazine of the Mizzou Alumni Association. Named to the Notable Properties list in 2008 according to this article published Jan. 26, 2008 in the Columbia Business Times. 600 S. Glenwood Ave., 1914. Note: According to the supporting documentation, the street address changed over the years. This used to be 300 S. Glenwood.) Style: Varied. W.W. and Jessie Allen Charters House. Named to Notable Historic Properties 2015. Named to Notable Properties 2015, see the newspaper coverage, video and supporting documents. 602 Sanford Place, ca. 1869, Italianate. Sanford and Kate Conley House. It is on the University of Missouri Campus. Here’s a link to an 1890 photo of the house. 606 S. College Ave. This is the Gathering Place B&B until December 2017. 710 Westmount, noted in this article published Jan. 26, 2008 in the Columbia Business Times written by Mike Martin. 716 W. Broadway, 1909, Colonial Revival. John and Elizabeth Taylor House, placed on National Register of Historic Places in 2001. The house was once a bed and breakfast, but was closed in 2012. It is now a private home. 823 Crestland Drive, nominated but not selected to the 2017 Most Notable Properties List. 1003 Sunset Drive. Nominated but not selected for the 2017 Most Notable Properties List. 1115 Locust St., named to the Notable Properties list in 2008 according to this Jan. 26, 2008 article published in the Columbia Business Times. 1133 Ashland Road, not on any historic homes list, but often written about because the part of the present building was built by Smithton/Columbia founder John Boyle Gordon. As of this 1989 article cited on this website, it was part of Tara Properties and owned by John McGee, Gary Evans and Tom Mendenhall. John Gordon was a farmer who also served five terms in the Missouri General Assembly, the Jan. 15, 1989 article in the Columbia Tribune notes. The house was renamed Rockhurst by Marshall Gordon after 1897 and it stayed in the Gordon family until it was sold to James Taylor in 1941, who in 1952 sold it to James Capen. 1201 E. Walnut St., ca. 1913. Late Victorian. J.G. Armistead House. Named to Notable Properties 2015, see the newspaper coverage, video and supporting documents. 1203 E. Walnut St., ca. 1913. Colonial Revival. Leta Miller House. Named to Notable Properties 2015, see the newspaper coverage, video and supporting documents. 1205 E. Walnut St., ca. 1910. Late Victorian. J.W. Sapp House. Named to Notable Properties 2015, see the newspaper coverage, video and supporting documents. 1223 Frances Drive. Named to the 2017 Most Notable Properties List. This is the home of Axie and Darwin Hindman. Darwin Hindman was the mayor of Columbia from 1995-2010, a 15-year stretch. Read more about his time in office in this Columbia Daily Tribune article from April 26, 2010. 1415 University Ave. Once the Phi Mu sorority house. 1506 University Ave. Nominated but not named to the 2017 Most Notable Properties List. Demolition danger — 1506 Hinkson Ave. — May 30, 2018 — Historic home may be razed, Columbia Missourian. Summary: A house at 1506 Hinkson Ave. in the Benton-Stephens neighborhood burned on May 10. The house may now be razed. The house is owned by Emmett McNulty. The house was built around 1925. 1508 Ross St. Nominated by not named to the 2017 Most Notable Properties List. 1619 University Ave. Nominated but not named to the 2017 Notable Properties List. 1719 University Ave., ca. 1938, Colonial Revival. Merle M. and Grace Prunty. Named to the Notable Properties List in 2007, per this article published in the Columbia Business Times written by Mike Martin. 2000 S. Country Club Drive, 1910. This 1910 stone Four Square house at 2000 S. Country Club Drive was moved to its present location from across the street. This Four Square is not on the Notable Properties list or the National Register of Historic Places. Yet, it still holds historic interest. It was once where 2007 S. Country Club Drive. It was moved to its current location in 1924 so Berry McAlester could reuse the site for a far grander home. 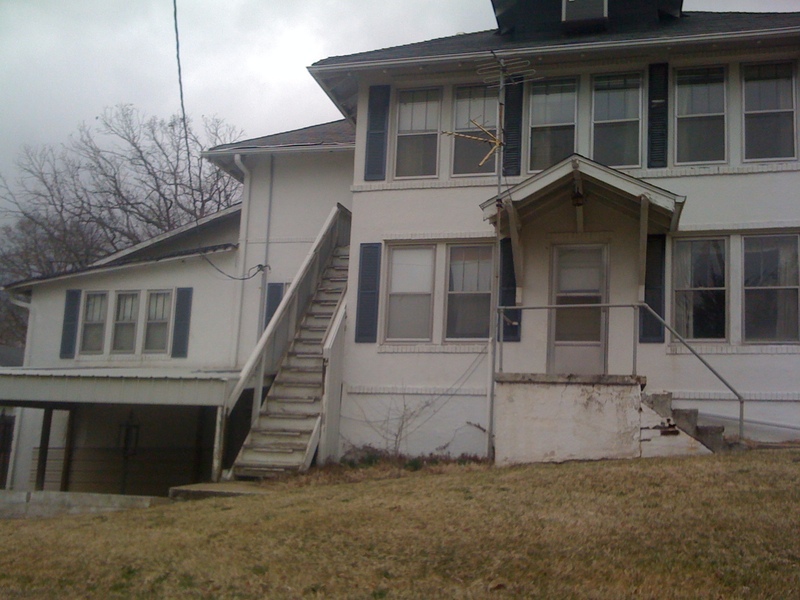 In 2010, this was the home of Mary Still, who was the Missouri state representative for District 025. She was elected in 2008 and served for four years. Previously, from 1975-1984, it was the home of Bruce Maier, the creator of Discwasher, a once well-known cleaning system for vinyl records. 2007 S. Country Club Drive, ca. 1927, Tudor Revival. Built by Barry McAlester, son of A.W. McAlester, who helped develop MU’s School of Medicine. The McAlester’s family crest presides over a living room which showcases a fireplace adorned with limestone carvings. The dining room features hand-painted wallpaper, according to this article, Honoring historic homes published in Mizzou, the magazine of the Mizzou Alumni Association. The home across the street, 2000 S. Country Club Drive, once stood on this spot. Barry McAlester moved that home which he’d also built so he could build this home on what he considered the better location. 2011 N. Country Club Drive, ca. 1883. Second Empire. Built for Dr. Andrew W. McAlester as a part of his 160-acre farm. McAlester helped develop MU’s School of Medicine. The stone gates at the head of Country Club Drive served as his entrance and the entire County Club area was a part of his farm. The house consists of oak framing with cedar lap siding on a concrete brick foundation. Read more about the house in this article, Honoring historic homes published in Mizzou, magazine of the Mizzou Alumni Association. Named to the Notable Properties list in 2008 according to this Jan. 26, 2008 article published in the Columbia Business Times. 2815 Oakland Gravel Road, ca. 1862, Italianate. 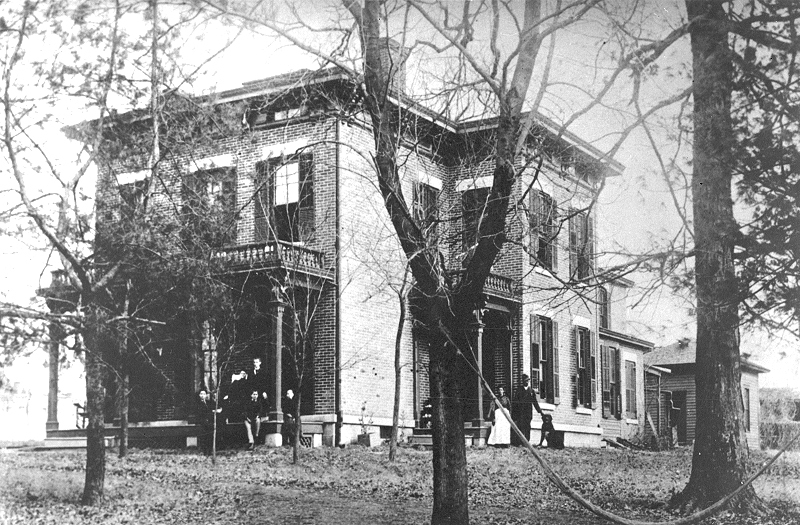 The David Guitar House, later called Confederate Hill. NOTE: There is conflicting evidence on whether David Guitar served in the Confederate forces or not. This 2013 article outlines the conflicting information. “Safeguarding History,” was published Sept. 13, 2013, in CAFNR News. The house was named to the National Register of Historic Places on Sept. 9, 1993. This home is currently owned by Pat Westhoff and Elena Vega who purchased it on Oct. 18, 2010 at absolute auction for $155,500. The house previously had been on the market for $499,000. According to this Oct. 4, 2012 article, Slave cabins in Boone County, the property has a slave cabin on it. 3700 Ponderosa St., 1877, Italianate. Maplewood House. Named to the National Historic Register 4/13/1979. This house is open to the public Wednesdays through Sundays from April 1 through Oct. 31, according to the Boone County Historical Society website. Gordon Manor, named to both lists at one time, was destroyed by fire in 1998 and demolished in 1999. It was near Stephens Lake, which is now within Stephens Lake Park operated by the City of Columbia’s Parks & Recreation Department. 8939 W. Terrapin Hills Road. A 2018 view of 8939 W. Terrapin Hills Road, a National Register of Historic Places home. This hallway shows the 1832 log cabin origins of the house at 8939 W. Terrapin Road. This ca. 1862-1903 house, built around a two-room 1832 log house, is on the National Register of Historic Places, but not on Columbia’s Notable Properties List, as it is not in the city. This 2010 article in Columbia Home and Lifestyles outlines the history of the home.